Raised in New Mexico in the '70's, Joshua Vogel traveled extensively through Australia, Haiti, Europe & finally the American West, where he pursued Anthropology and Art History at New Mexico State University in Las Cruces. Architecture studies followed at the University of Oregon, where Vogel also began working in earnest with wood. By the mid 90's Vogel had again relocated, this time to New York City where he worked to establish his first studio. Eventually focusing his expertise exclusively on furniture design & production, Joshua co-founded BDDW, a recognizable, heirloom quality, American made furniture & design company. 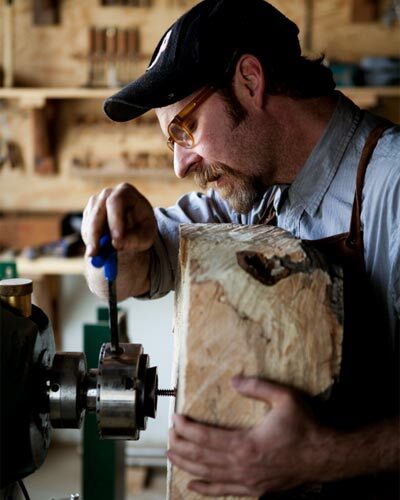 Ultimately choosing the country lifestyle over that of the city, Joshua moved to the Hudson Valley to rediscover the basics; not only of life, but of design, woodworking & his first love - wood sculpture. Known to be meticulous and detail oriented, it is Vogel's indomitable energy to build, innate sense of larger design issues, and love of process that set him apart. Joshua is the author of "The Artful Wooden Spoon" (chronicle books 2015) and has taught workshops and segments at the Center for Furniture Craftsmanship & Pratt Institute.